Nightfall With Edgar Allen Poe is Helen Hayes Recommended & More! Well, I can certainly play a convincing psychopath. Feel free to read the rest of the review here or check out all of my mentions on my Press page. If you’re planning on joining us for our next two weekends, make sure to get your tickets soon. Every show we’ve had so far has either been sold out or damn near close. Reserve your tickets at Molotov’s website here. Finally, I’m happy to announce that I got the chance again yesterday to shoot with HBO’s Veep. I always have a great time whenever I get the chance to shoot for that show and yesterday was no different. There’s some big surprises that I can’t talk about in Season 4 that I can’t wait for people to see. I’ll make sure to be keeping everyone updated on when you can spot me behind some big names coming up soon. Until then, see you at Nightfall! 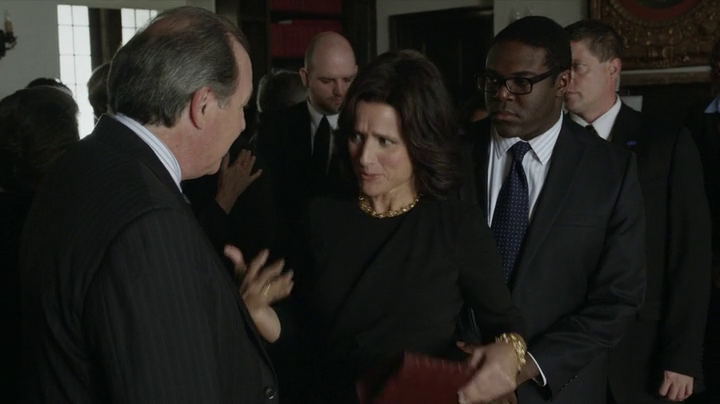 Why yes, that is me appearing on Veep last night. As you can tell, Julia and I are best friends and occasional lovers. Or, at least, we occupied the same space for a few hours. Hoping to make more of these arbitrary television appearances soon, so keep your eyes peeled. In the meantime, check out more pictures from my appearance at my Pictures page. Since I decided to launch this little corner of the web for myself a few years ago, I’m happy to say I’ve finally hit a first milestone. Today I have passed over 1000 views! While I’m not sure why I’ve gotten hits from Bahrain, Peru and the Russian Federation, why ask why? Welcome, my international brothers and sisters! In order to celebrate, I’m happy to say that I’ve finally added pictures from last Fall’s production of Chupy & The Science Twins, which you can view here. So if you’ve ever fantasized about what I would look like in a mummy costume, your dreams have finally come true. In the meantime, rehearsals are up and running for Doorway Arts Ensemble’s production of Morning, Miranda. Make sure to mark your calendars with the dates and times here, and make sure to follow me on Twitter here with rehearsal updates and what-nots. And finally, HBO just gave us a video teaser on the 3rd season on Veep. I actually started watching the series last week, and I’m proud to say that it’s a pretty funny and witty show. It’s nice to know that I’m looking forward to the the 3rd season premiere for a reason other than seeing my handsome face. Still no luck on an upcoming episode synopsis, but here’s a little something to keep us happy for another 52 days. 2 posts in not only a month, but a week? WHAT MADNESS IS THIS?!?! Just wanted to pop in and let everyone know a few bits of information. First of all, I’ve made a few website tweaks. I’ve gussied up the Important Links page with some graphics, which can be viewed here. Consider it a love letter to all of the companies I’ve worked with. Also I have a new Resumé which can be viewed here, in glorious black and white PDF form for your viewing pleasure. And finally, just one quick note: HBO has given the premiere date for Veep‘s 3rd season. It starts on April 6th, 2014. That’s a little over 2 months until you get to see me stumbling around behind Julia Louis-Dreyfus. I’m not sure if I’ll be in the first episode or not, I’ll know once they release a plot summary for the impending episodes. But as soon as they do, I’ll make sure to post the date and time right here. So check back here soon for the date and time of my HBO “debut”.